If you want to speed up the development of your .NET applications, you're ready for C# design patterns -- elegant, accepted and proven ways to tackle common programming problems. 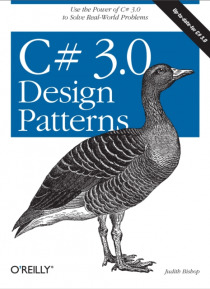 This practical guide offers you a clear introduction to the classic object-oriented design patterns, and explains how to use the latest features of C# 3.0 to code them.C# Design Patterns draws on new C# 3.0 language and .… NET 3.5 framework features to implement the 23 foundational patterns known to working developers. You get plenty of case studies that reveal how each pattern is used in practice, and an insightful comparison of patterns and where they would be best used or combined. This well-organized and illustrated book includes:An explanation of design patterns and why they're used, with tables and guidelines to help you choose one pattern over anotherIllustrated coverage of each classic Creational, Structural, and Behavioral design pattern, including its representation in UML and the roles of its various playersC# 3.0 features introduced by example and summarized in sidebars for easy referenceExamples of each pattern at work in a real .NET 3.5 program available for download from O'Reilly and the author's companion web siteQuizzes and exercises to test your understanding of the material.With C# 3.0 Design Patterns, you learn to make code correct, extensible and efficient to save time up front and eliminate problems later. If your business relies on efficient application development and quality code, you need C# Design Patterns.